I’ve replenished my supply of adhesives and so tonight finds me happily progressing on a new piece that is not quite like anything I’ve dine before. I suppose that is what it’s all about, but still it’s definitely a meandering in a new direction. The statue of Mary and baby Jesus were bought at a church basement rummage sale–no doubt the infant’s missing right hand landed them there–as was the powder blue iridescent glass light fixture that is in the piece as the first aura. Oddly, it appears golden here. 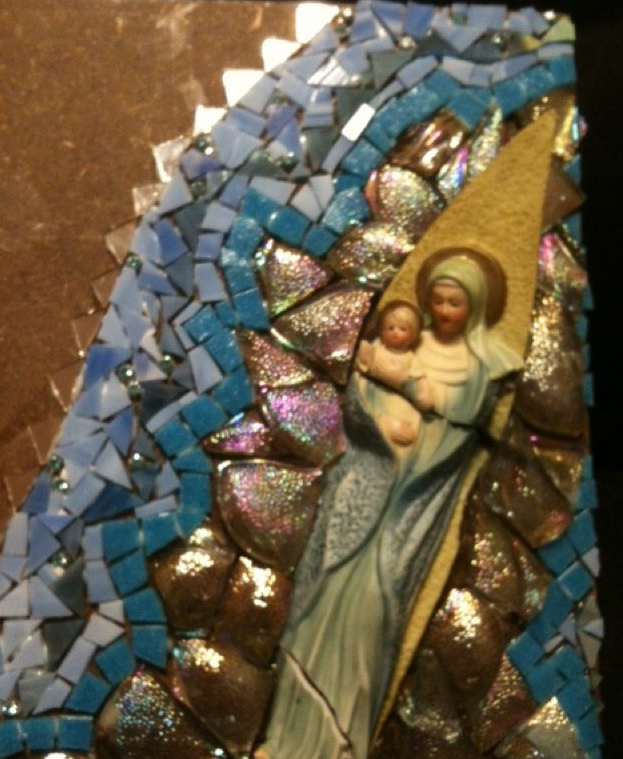 Other tesserae used in the piece include regular and iridescent stained glass, vitreous tile, rhinestones and mirror glass that makes up the outermost glow and appears clear in the bottom left corner. I hope to finish it tomorrow. It’s good to be playing with broken glass again, even if I wander into uncharted territory. An odd observation: I’ve never pictured Jesus as a blonde. Hmm. Go figure.